Much like zombies in zombie movies, zombie movies are everywhere. You think you’ve seen them all when suddenly a hoard of the things appear around the corner. Within the zombie movie genre, there are films that try to take it further, like World War Z, or films whose premise is simple but brilliantly executed like 28 Days Later, those that try something different like, erm, Warm Bodies, and, of course, absolute classics and originators, like Dawn of the Dead. The best sub-genre, however, is arguably the zombie comedy. Self-referential films aware of the ridiculousness of the whole scene but at the same time showing nothing but love and respect for it. The zombie comedy is hard to pull off, but when it’s done right it can transcend the genre. Since Shaun of the Dead – the defining zom-com (or even zom-rom-com) – other films like Zombieland (brilliant), Dead Snow (ridiculous) and Life After Beth (meh), have thrown their hats into the ring with varying results and receptions. Now, however, there is another film to add to that list, and one which seems to be on track to redefine the zombie comedy genre for good. One Cut of the Dead opened in select cinemas in Japan last year, and has slowly but surely been gaining a cult following ever since. Made for just $27,000, the film has now taken $7.2 million at the box office, according to The Hollywood Reporter, and shows no signs of slowing down yet, with a final figure of double that being forecast. The film, which starts with a 37-minute single take, follows an amateur film crew as they try to make their own zombie film before events take a dark turn. The film currently has a 100 per cent rating on Rotten Tomatoes, and has delighted audiences at film festivals across the world, garnering a standing ovation and Audience Award at this year’s Udine Far East Film Festival in Italy. The film was picked up by Third Window Films for international distribution, while Japan’s Nikkatsu are the distributors in Asia. When Adam [Torel] from Third Window brought it to me and I heard about the budget, I thought ‘Oh, another indie zombie film,’ but then I watched it and I fell in love with it. 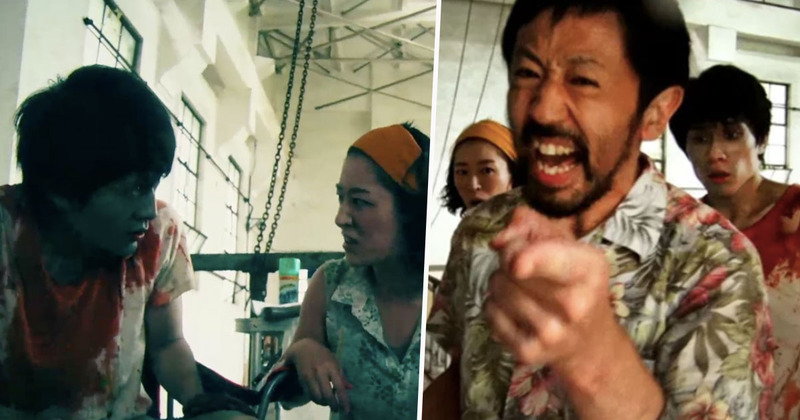 The film’s director/writer/editor, Shinichiro Ueda, made One Cut of the Dead in just eight days after taking part in workshops for upcoming actors and filmmakers at the Enbu Seminar drama school in Tokyo. The drama school also initially distributed the film, and thanks to a few rave reviews overseas, it was released in just three cinemas in Tokyo last year. Despite this, the film’s popularity still grew, gaining praise on social media from the industry and fans alike. Eventually worldwide distributors stepped in, and the film is now set to be shown in more cinemas throughout October. Much like Shaun of the Dead, One Cut of the Dead has been praised for its comedy, twists and fresh take on the genre, and proves you don’t need a big budget to create great films.